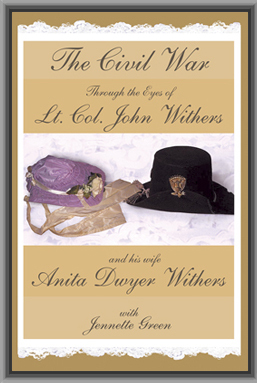 Providing a unique perspective on the American Civil War, this book weaves together the diaries of Lt. Col. John Withers, an Assistant Adjutant General for Jefferson Davis, and his wife, Anita Dwyer Withers. Reports of battles fought meld with domestic life in these journals, creating a multi-dimensional picture of the Withers’ lives together during the “War Between the States.” Jointly, their diaries encompass the entire length of the Civil War; from May 1860 – September 1865. A West Point graduate, John Withers served as an officer in the U.S. Army. Anita Dwyer Withers was the daughter of a distinguished citizen of San Antonio. In September 1860, Withers was ordered to Washington, D.C., and assigned duty as an Assistant in the Adjutant-General’s office. As Anita was very close to her family in Texas, she was deeply troubled by the move. She wrote, “I regret it mightily.” In Washington, John served under General Samuel Cooper’s command until March, 1861, when he resigned his commission in the U.S. Army and came south to join the Confederate cause. Because of the nature of his job in the Confederate capitol of Richmond, Lt. Col. Withers and his wife were closely acquainted with many of the notable figures of Civil War history, including Jefferson Davis, his wife, Varina Davis, and the Secretary of War. John and Anita recorded Civil War events as they happened, including the Seven Days Battles. Each also wrote of the more personal aspects of their lives, such as Anita’s near fatal illness and the agony of their young son’s death. Lt. Col. John Withers and Anita were ordinary people living in extraordinary times. Their story is timeless, and well worth being remembered. This book weaves together the diaries of Lt. Col. John Withers, an Assistant Adjutant General for Jefferson Davis, and his wife, Anita Dwyer Withers. Reports of battles fought meld with domestic life in these journals, creating a multi-dimensional picture of the Withers’ lives together during the “War Between the States.” Jointly, their diaries encompass the entire length of the Civil War; from May 1860 – September 1865. A West Point graduate, John Withers served as an officer in the U.S. Army in Michigan, New York, California, Washington, Oregon, and Texas. As a Brevet Captain in 1857, Withers was appointed as Staff-Assistant Adjutant General for the Department of Texas. Captain John Withers’ wife, Anita Dwyer Withers, was “the daughter of a very distinguished citizen of San Antonio, and who was connected with the exciting scenes that delivered Texas from Mexican rule and Indian terror,” later wrote John Withers’ friend, D.S. Stanley. Anita married John on June 15, 1859. In September 1860, six months after the birth of their first child, Captain Withers was ordered to Washington, D.C., and assigned for duty as an Assistant in the Adjutant-General’s office. As Anita was very close to her family in Texas, she was deeply troubled by the move. She wrote, “I regret it mightily.” In Washington, D.C., John served under General Samuel Cooper’s command until March, 1861. As an Assistant Adjutant General working in Richmond, VA, both Lt. Col. Withers and his wife were closely acquainted with many of the notable figures of Civil War history, including C.S.A. President Jefferson Davis, his wife, Varina Davis, and the Secretary of War. Edward A. Palfrey later wrote, “his relations with the President and Secretary of War were of an intimate character, as was necessarily the case from the position he held.” In addition, Withers mentioned meetings with famous Confederate Generals Robert E. Lee, Joe E. Johnston, A.S. Johnston, and others. He casually alluded to other heads of state that he met as a matter of course in his position. 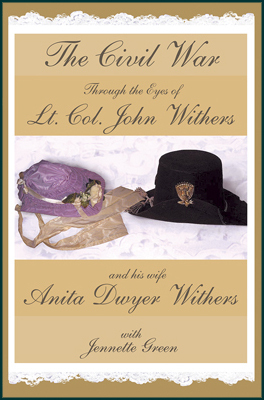 While stationed in the Confederate capitol of Richmond, Virginia, both Anita and Lt. Col. Withers recorded Civil War events as they happened, including the Seven Days Battles, and other battles that took place during the “War Between the States.” Each also wrote of the more personal aspects of their lives, such as Anita’s near fatal illness and the agony of their young son’s death. Anita’s diary records the family’s transition from Texas to Washington D.C., then to Richmond, VA, and later to Texas again near the end of the war. In all, her journal records events from May 1860 – September 1865. Many selected excerpts from her diary are included, which complements Lt. Col. John Withers’ journal (October 1860 – December 1862). Both Lt. Col. John Withers and Anita’s diaries provide a detailed Civil War timeline rich in facts and details. John and Anita were ordinary people living in extraordinary times. Their story is well worth being remembered. May 4th. 1860. May the 1st. was the first time that I went down to breakfast with my Husband since the birth of our baby. That morning I practised on the Piano, and took a ride in the afternoon. May 4th. All well (T G) Mrs. Mitchell, Miss Conrad, Miss Post, and Miss Rodriguez called to see me, they were all delighted with little Edward. We took a short drive. My Mother came over in the evening to take care of the baby so that I might go and hear the Swiss bell Ringers but I did not care to attend. May 7th. A very windy day. The Capt. and myself made a few visits today, for the first time since the birth of my Edward. May 10th. Thursday. A beautiful day, our bath house was completed today, it is a mighty nice one. My Mother and myself went down to see it this morning. Ma bought the baby a sweet little hat at $4. We had a number of calls today, and we took a drive in the evening. The Captain was planting Water melons all the afternoon. May 14th. Monday. Quite warm and close today. I stayed at home as usual all the morning. In the afternoon we took the baby out driving for the first time, he paid Miss Conrad a visit, they were all delighted to see him, he behaved exceedingly well, didn’t cry at all. Capt. and Mrs. Lee called whilst we were out. We remained at home in the evening. May 22nd. Tuesday. Today the baby is two months old, his Papa weighed him and he has gained 2 lbs this last month. He now weighs 11 lbs. June 15th. The Anniversary of our marriage, we have been married a year 1860. In the morning we arranged the house for an entertainment. Miss Aurelia and Mrs. Mickling came in today to assist me. They made the chicken salad and got Joe [Anita’s brother] to help them. We set the table very prettily in the afternoon. I have had the headache all day, and got worse in the evening. I was obliged to leave the company and go upstairs to bed. About half past seven we went to the New Church with the baby, a great number of persons were already there. The Church was all lighted very prettily. Father Shean performed the ceremony. The party went off very well, although the Captain sent the Mexican musicians off. Joe played Robert on the Violin and I accompanied him on the Piano. June 19th. Tuesday. The Capt., baby and myself took a ride before breakfast. In the afternoon I made a few calls, went to the casita and took a drive with Joe and the Captain. After Tea Joe and Capt. went to call on Col. Lee—and Mr. Toutant. Joe talked about Miss Whitely and made my Mother mad. June 20th. Wednesday. The Capt., baby and myself took a drive before breakfast. My Ma and myself went to see Isabelle Casiano who has a young baby. Joe was fined 6 dollars today for galloping on horseback in town. July 22nd. Joe, my Ma and myself went to six o’clock Mass, I lost a little veil I had. Today the baby Edward is four months old, he weighs 13 and a half pounds. My Mother, the Capt, Joe, Myself, Charlotte with the baby went out to Major Dashiell’s after our siesta. We had a nice moonlight drive returning. After Tea my Ma, Capt. and Joe commenced talking about the cattle on the Ranch, upon which topic my Mother got mad and went home.